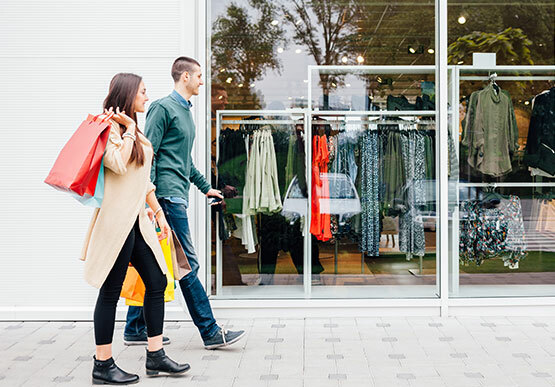 Head north of downtown San Diego, CA for the best bargains on top designer brands at Carlsbad Premium Outlets near our boutique accommodations. Upgrade your shoe game and sports gear at Nike, Reebok, Adidas, and Puma. Find cute clothes for the little ones at Baby Gap, Carter's, and Disney. Pick up a new bag or sunglasses at Cole Haan, COACH, or Michael Kors. Give your wardrobe a whole new look by shopping for outfits at DKNY, Tommy Hilfiger, Anne Taylor, and Calvin Klein. Kick it up a notch with designer brands like Kate Spade, Tory Burch, and Lacoste. When hunger strikes, swing by Mot'to Japanese Grill, Ruby's Diner, Rubios, Panda Express, or Blaze Pizza. If you're looking for something on the lighter side, this outlet mall has a Starbucks, juice bar, and pretzel shop. Varies per item at store. What stores are at Carlsbad Premium Outlets? Enjoy shopping for clothes, shoes, accessories, and home décor at the discounted stores within Carlsbad Premium Outlets. Shop at Puma, Reebok, Nike, and Adidas for sportswear. Find deals at Gap, Banana Republic, DKNY, Lacoste, and Tommy Hilfiger. Try designer brands like Tory Burch, COACH, Micheal Kors, Movado, and Barneys New York Warehouse. Does Carlsbad Premium Outlets have a kids play area? Yes. There's a little playground area where you can bring your little ones to in between your shopping. It's important that you keep an eye on your child as there is no supervision in the play area. You can also keep them entertained with the small train ride or treat them to some of the coin-operated ponies and cars sprinkled throughout the mall.